CLICK HERE for your Logan’s Roadhouse coupon. Good from Thursday, April 25 through Sunday, April 28, 2019. Present coupon when ordering. Good on food and non-alcoholic purchases only. Valid for dine-in or carry-out. Not valid in CA, NC, SC or Augusta, GA locations. Cannot be combined with any other offer, coupon or discount. Logan’s announced the deal in This Email. Logan’s Roadhouse has an $9.49 early bird special good every day. 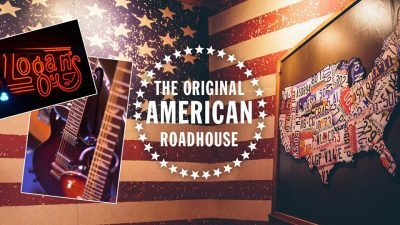 CLICK HERE for the American Roadhouse menu. Not valid with other offers, discounts or promotions. Listed items only. Offer may not be available on Holidays. Not Available in CA, NC, SC, or Augusta, GA.
Logan’s Roadhouse has a new happy hour with specials such as $3.50 cocktails and $4 appetizers. Good from 3 to 6 pm daily. CLICK HERE for the Logan’s Roadhouse Happy Hour menu. Deals may vary by location. Logan’s Roadhouse is a chain of restaurants that was founded in 1991. Its main office is located in Nashville, Tennessee. There are over 210 company operated and 26 franchised Logan’s Roadhouse locations throughout 23 states. The chain uses retro style decorations, and provides free buckets of peanuts that come at each table, the shells of which customers are allowed to dispose of on the floor. Some of the Logan’s establishments have locality-inspired decor and artwork. For example, Detroit area Logan’s have murals of people wearing Detroit Pistons shirts.